Warlord Titan: It’s the journey, not the destination. | 30mm Madness! Warlord Titan: It’s the journey, not the destination. ‘Step 1’ in the instruction manual… attaching the ‘ball’ to the hip joint (kind of an inverse femoral head for those willing to google hip anatomy). I scored the heck out of all the smooth flat surfaces of the join with an x-acto knife then liberally applied JB-Weld. I purchased the larger 5oz tubes of JB-Weld as I plan on using lots and lots of JB-Weld on this warlord. JB-Weld just feels a lot less brittle and a heck of a lot tougher than Cyanoacrylate (CA). It takes ~12 hours to cure, which also helps me SLOOOOW down on the build, enjoy it more and not make stupid mistakes because I’m trying to rush assembly. These are ALL of the pistons on a warlord titan. For anyone that’s assembled a Reaver or Warhound, the small number is a HUGE RELIEF. I probably spent 20% of the entire build time of the warhound/reavers on the pistons. Here are the completely trimmed pieces. All gate/vent resin has been cleanly removed. Any flash lines and mold misalignments removed with the GW mold line remover. 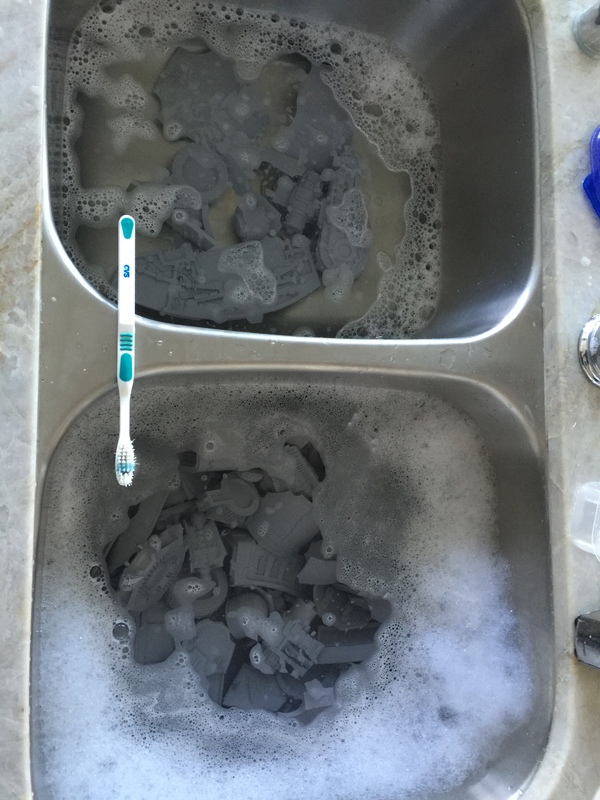 Probably the least fun part of prep is ‘THE CLEANING.’ To get clean casts, a mold release must be used. The whole point of mold release is to prevent other materials (the mold) from bonding to the part. The problem is that it also prevents PAINT from bonding to the resin, which is of course a huge problem on a Titan. So… a toothbrush, lots of dish soap and rinse water, lots of scrubbing, and 2-3 hours of time, and CLEAN! This step definitely gets old after 171 pieces (ugh). However, early on with ForgeWorld resin I skipped this step, and there’s nothing worse then removing a piece of very gently adhesive masking tape from a base coat and having the entire paint film pull up, ruining an almost complete model. 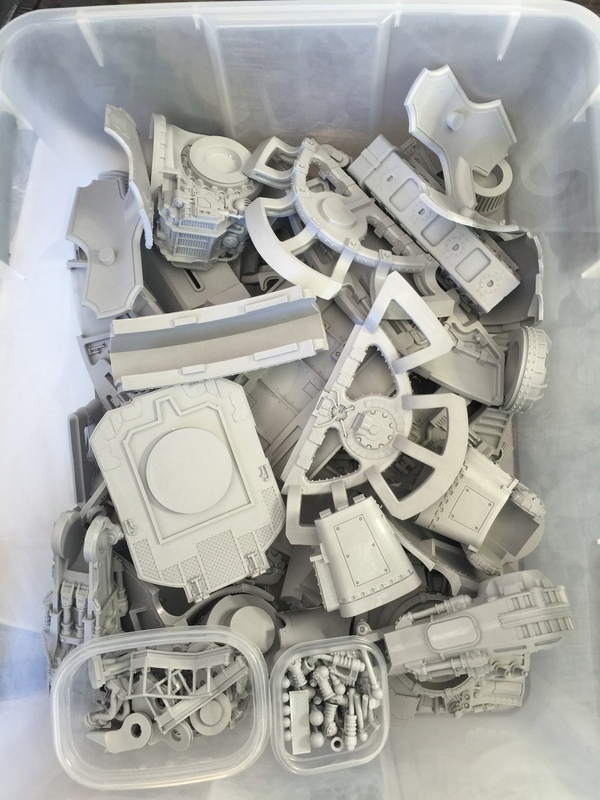 I often skip this step with the games workshop injection molded plastics…but NEVER with resin. Trust me, it’s worth the time! I will also do one final soap/scrub/rinse once the entire model is put together right before priming. A little advice/perspective on Titan building: It’s the journey, not the destination. Once you realize this, Titan building is AMAZING. Every few nights for the next 3-4 months I will do ONE OR TWO STEPS of the assembly process, and each step will take 1-2 hours. 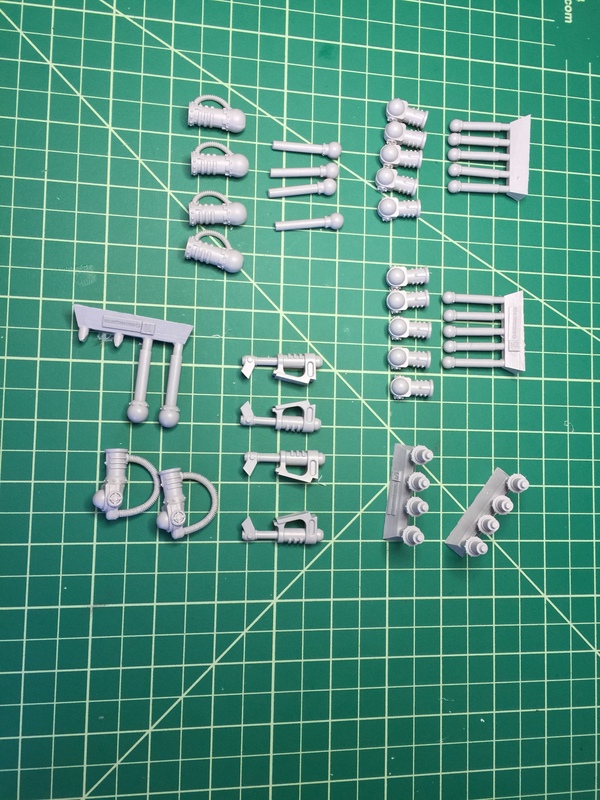 I will get each step as perfect as possible… test fit it, re-test fit, sand, score, drill/pin, etc. Each morning I will wake up and have something small to look forward to. Like a little kid on christmas morning I’ll run down and ‘check my Titan.’ I’ll remove the clamps and confirm that the bond is strong and that everything is aligned correctly and looking great. It’s great! Stretching out the build over 3+ months help justify the cost and avoid a crappy outcome / build mistakes. If I spend 10-12 hours / week over 12-16 weeks = $1900 USD / 120 to 192 hours = $9.90/hour to $15.85/hour. And that’s just the build, so every time I field it in battle (rare) and every minute I see it on display in my office (often) adds to the value. It’s still ridiculously expensive, but what an amazing creation these things are! This entry was posted on September 7, 2015 by justinhardin. It was filed under Legio Titanicus, Warhammer 40K .